A can of pumpkin doesn't have to become a pumpkin dessert -- it also works beautifully as a shortcut to savory dishes. 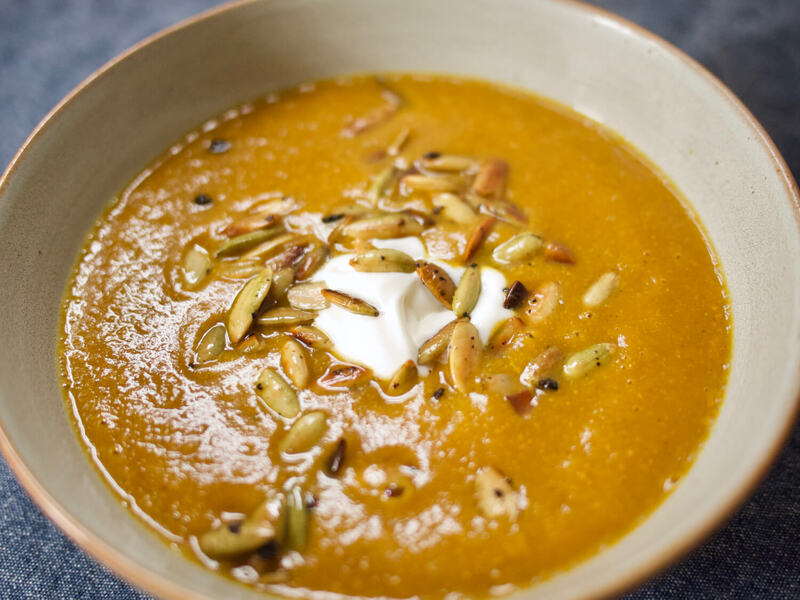 This soup, which combines pumpkin puree with a blend of warm spices and some unexpected ingredients -- an apple for sweetness and a handful of toasted pumpkin seeds for a nutty depth. Next time you find yourself with a spare can of pumpkin in the cupboard, give this recipe a try for the perfect fall soup with a slight kick, thanks to the Vanns Ancho Chili and Chipotle Chili Powders. Heat butter over medium heat in a 3-4 quart saucepan until melted. Add ¼ cup pepitas and sliced onion and cook, stirring occasionally, until onion is soft and golden and pepitas are starting to brown, about 10 minutes. Add the apple, black pepper, cinnamon, and ancho chili powder and cook until fragrant, about 1 minute. Add pumpkin and 4 cups water and stir to combine. Bring mixture to a boil, reduce heat to medium-low, and simmer for 30 minutes. While soup simmers, heat a small, dry skillet over medium heat and add pepitas and chipotle chili powder and cook, stirring, until pepitas are golden brown and chipotle powder is fragrant, about 5 minutes. Allow the soup to cool slightly and then puree until smooth, either using an immersion blender, or a stand blender, in batches. Return the soup to the saucepan and season with salt to taste. Serve topped with crema or sour cream and a sprinkle of chipotle pepitas. Serves 8. Adapted from The New York Times. This soup falls into the category of “Total Classic” and deservedly so. The silky bean and vegetable soup and the woody aroma of rosemary make for perfect complements to each other, the starch of the beans standing up to rosemary’s strong flavor, and the flavor of the rosemary bringing out depths of flavor in the beans that otherwise might remain hidden.